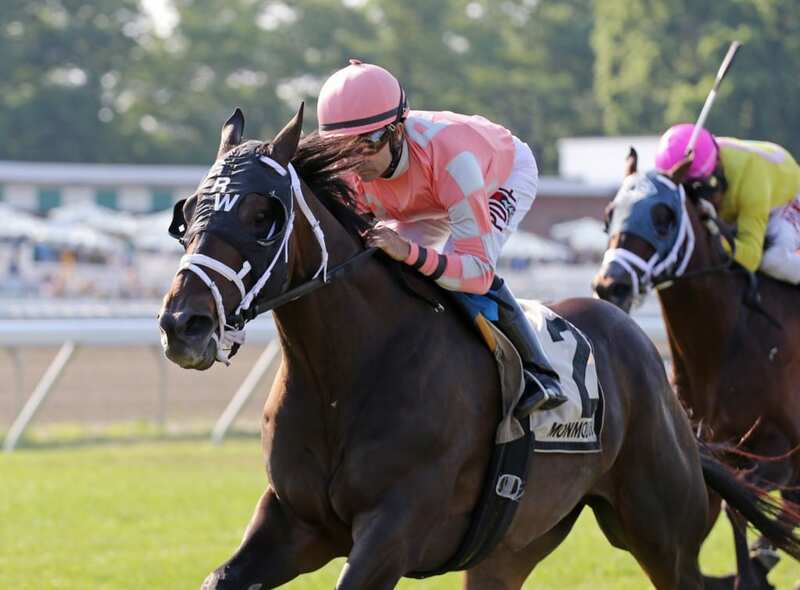 Majestic Dunhill continued a strong start to his 3-year-old campaign, overcoming stretch traffic before finally shaking free to score a handy 1½-length victory over longshot Like What I See in the featured $60,000 My Frenchman Stakes on Saturday at Monmouth Park. Ridden by Joe Bravo, Majestic Dunhill struggled to find room in mid-stretch before getting a seam late and drawing off. The Kentucky-bred son of Majestic Perfection-Candy Fortune, trained by George Weaver, covered the about 5½ furlong distance in 1:02.35. It was another three-quarters of a length back in third to ReedKan. Majestic Dunhill made his sophomore debut a winning one on June 23 in a 5½-furlong allowance race on the grass at Monmouth Park, rallying to win by a neck. He was closer to the pace this time in the field of nine 3-year-olds. “I was concerned coming back after just three weeks,” said Weaver. “He ran a pretty hard race off the bench. I really don’t like coming back like that in three weeks but when you sort out where you want to go for the summer and fall this fit the schedule and was showing h was ready. Now 3-for-7 lifetime, Majestic Dunhill is 2-for-2 this year. He paid $5.20 to win, with the exacta with 60-1 Like What I See returning $226.40. Weaver said Majestic Dunhill would be pointed next to the Quick Call at Saratoga on Aug. 8.